Whole Wheat Waffles cheer, “Weeeeeeeekend! 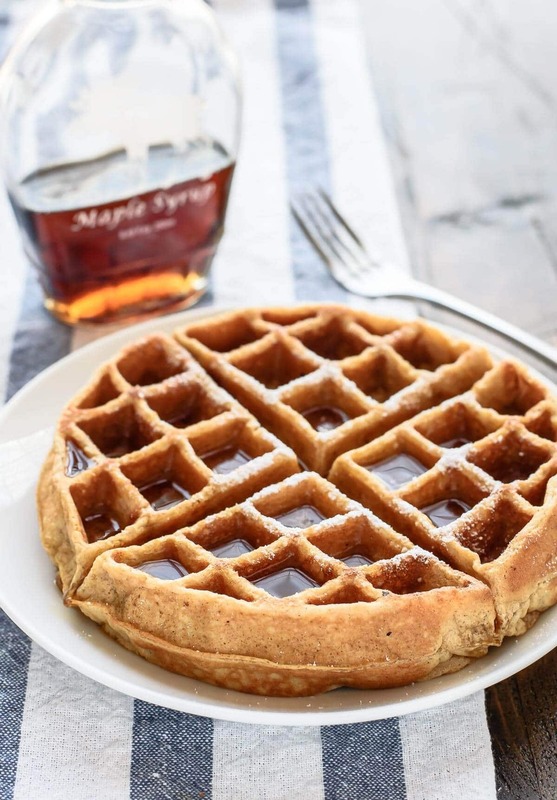 !” Those lightly crisp outsides, tender, fluffy insides, and pockets so clearly intended for filling with melty butter and ripples of pure maple syrup make any morning instantly special. 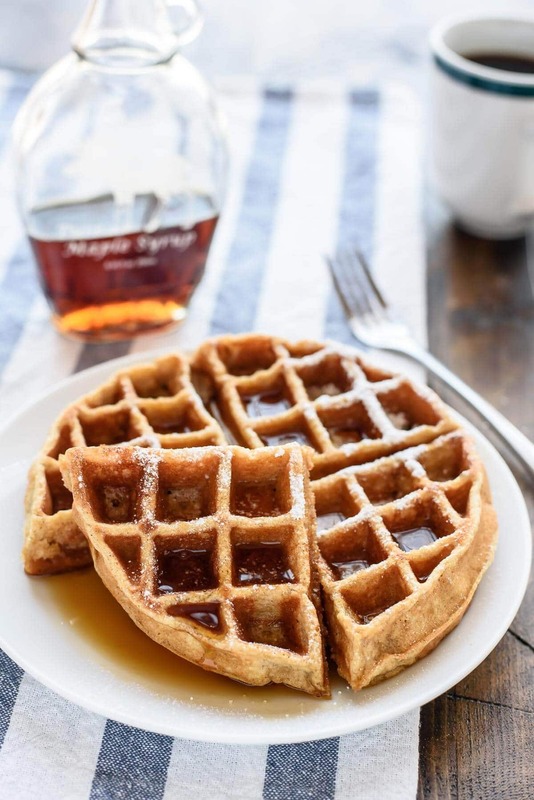 Waffles have the vibe of being more effort than pancakes, so they leave you feeling pampered, but as you’ll see, this particular healthy waffle recipe comes together in one bowl (your blender!). The batter is ready to go in 10 minutes, which is conveniently about how long your waffle maker will need to preheat. In fact, go run over and plug your waffle maker in now. It’s probably hiding in the back of a cupboard, wedged behind the toaster oven and the single-serving smoothie maker you keep promising yourself you’ll use. Smoothies can start Monday. Today it’s all about healthy Whole Wheat Waffles with applesauce! Thanks to a lighter ingredient list, these yummy waffles are filling and wholesome. Feel great eating them this weekend, then stow a few in your freezer and toast them off on weekday mornings before you head to work. The healthiest freezer waffles are the ones you make yourself, and this recipe is an ideal place to start. White Whole Wheat Flour. It’s 100% whole grain and has all the same health benefits as regular whole wheat flour, but its flavor is far more mild. If you didn’t know you were eating the best white whole wheat waffles, you would assume that they had been made with regular all-purpose white flour (and your picky eaters will assume the same!). Unsweetened Applesauce. One of the oldest healthy baking tricks in the book, and one of the best! Despite being low fat whole wheat waffles (a feat usually achieved via melted butter), these waffles are incredibly tender. I swapped more than half of the butter for applesauce with great results. Butter. Yes, you do need some. Butter is what allows the waffles to crisp on the outside. If you prefer not to use butter, you can swap melted, cooled coconut oil instead. Now, because homemade waffles are most often cooked on weekends, and because on the weekend, I prefer max laziness and minimal dishes, I decided to see if I could make the waffle batter using my blender. I’d had wild blender success with other healthy breakfast recipes like these Banana Oatmeal Pancakes and these Banana Oatmeal Muffins, so I thought I’d see if the same approach could work for waffles too. SCORE! I was worried the waffles would be tough or chewy, but they were remarkably airy. I loved that I could pour the batter directly from the blender’s spout into my waffle maker too. One fewer dish to wash. If you’d like the whole wheat waffles vegan, I don’t have a specific suggestion since the recipe calls for eggs, *but* I think you could try swapping flax eggs. If you decide to play around with this, I’d love to hear how it goes! Mix-ins. Chocolate chip whole wheat waffles, blueberry whole wheat waffles, pecan whole wheat waffles, you name it! Fold about 1/2 cup of any mix-ins you like into the batter after it is blended. (NOTE: If making chocolate chip waffles, let the batter cool before adding them—the machine’s blade may warm up the batter, causing the chocolate chips to melt.) You can also sprinkle the mix-ins onto individual waffles before closing your waffle maker. Arrange cooked waffles on a cooling rack and let cool completely. Transfer to a parchment-lined baking sheet. If you’d like smaller portions (or want to scale the waffles down so that they fit in your toaster), break them into sections first. Place the baking sheet in the freezer until the waffles harden. Transfer to a ziptop bag, squeezing out as much air as possible before you seal it. Label the bag with the date (I always thank myself later when I do this), then freeze for up to 3 months. Preheat your oven or a toaster oven to 350 degrees F.
Arrange the frozen waffles on a parchment-lined baking sheet. Bake for 7 to 10 minutes, until the waffles are crisp and warmed through. I find that unless you have a toaster with really wide slots and fancy temperature settings, the outsides tend to burn before the middles are hot. As a workaround, to reheat the frozen waffles using your regular toaster, place the waffle on a plate and microwave it for a minute or two first to warm it through. From there, crisp up the outsides in your regular toaster. Blender: I’ve been lusting after a high-powered blender like this one. I’ve also used and recommend this more affordable one and this one. 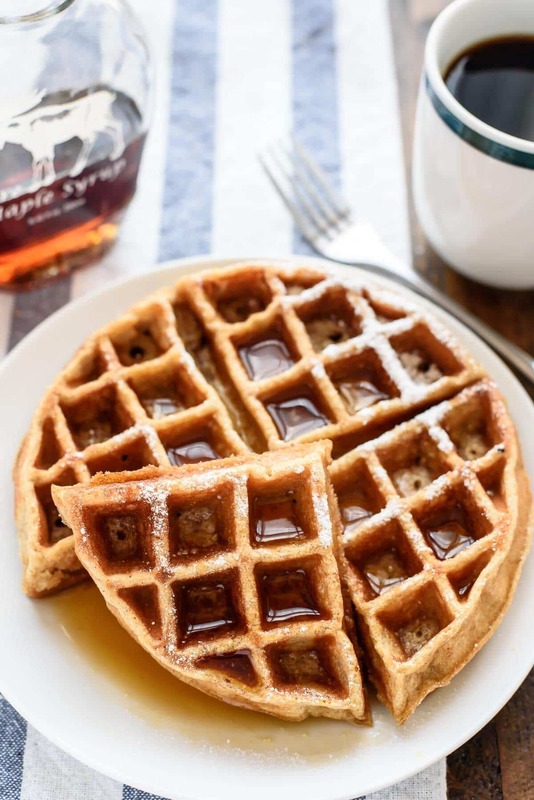 Healthy whole wheat waffles with applesauce. 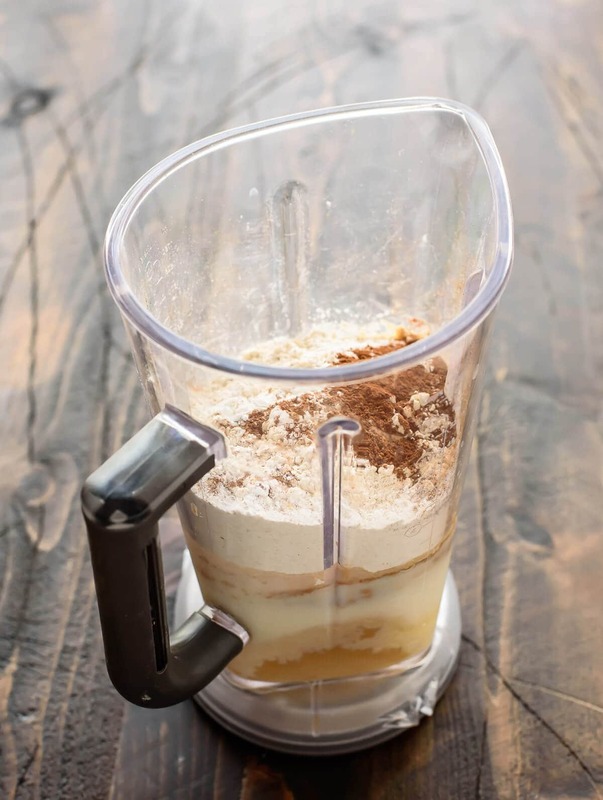 Easy blender recipe with quick clean up! Low fat, fluffy, and perfect for freezing in batches for later. 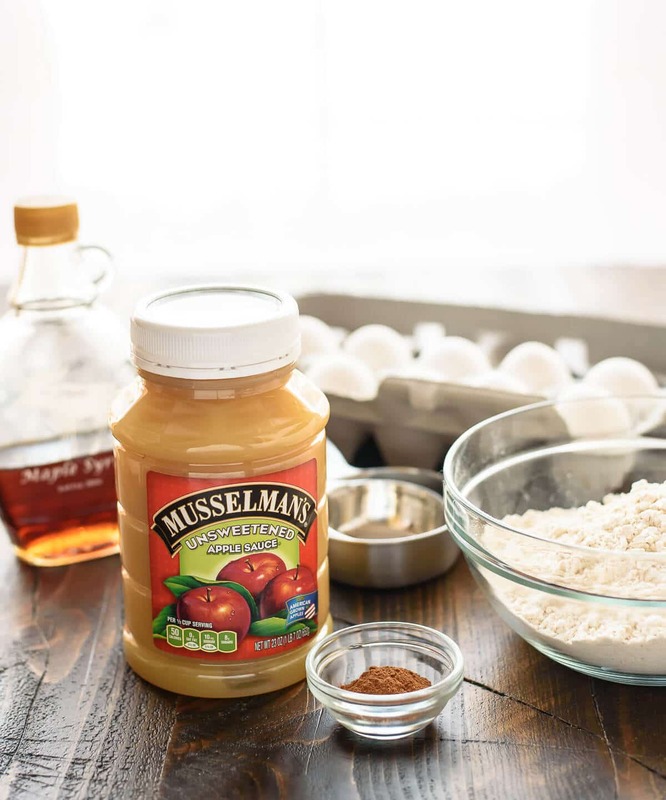 Place the applesauce, milk, butter, eggs, maple syrup, and vanilla extract in a blender. Sprinkle in the flour, baking powder, cinnamon, and kosher salt. Blend just until combined, pausing the blender to scrape down the sides as needed. Cook the batter according to your waffle maker’s instructions. If desired, place the waffles on a baking sheet and keep warm in the oven. Enjoy immediately with your favorite waffle toppings. See blog post above for step-by-steps to freeze and reheat waffles. You can also refrigerate the waffles for up to 1 day. Waffles in a blender?? Now why am I just now hearing about this? Genius. These beauties look like the PERFECT lazy-weekend breakfast! Oh these look so good! Happy New Year girl! Happy New Year! These waffles look amazing and so healthy too! Definitely a good way to start off the new year. :) Also, how awesome that you can make them in a blender!! Happy New Year to you too Roxana! I hope you are having a great weekend! These look so perfect? I’ve been cravingg waffles and these lightened up ones are perfect for the New Year! Can’t wait to give them a try this weekend. Its a good thing I love my blender because I wanna make these waffles ASAP! Claudia, I am so happy to hear that you loved these waffles!! Thanks so much for trying the recipe and letting me know how they turned out for you. YUUUM! I’ve had a waffle iron on my wishlist since forever, and now I just keep drooling over insanely delicious looking recipes like this one and waiting for the day I get to buy one! Fantastic! How neat are these? The perfect way to kick off 2016 I think! Excited to try this! Is the calorie count for one waffle for serving? Thanks! Hi Breanna, yes, that’s correct. I’ve updated the recipe box too—sorry for the confusion! I made these waffles with 100% whole wheat flour and also another batch with 50/50 whole wheat and all-purpose. Both ways were great! They are super moist and you can’t beat how easy they are to make. I’m definitely putting these into regular rotation. HOORAY! I’m so happy that you liked this recipe Rachel, and I appreciate the details on the different flours you tried too. That will be so helpful for others. Thanks for trying the recipe and letting me know how it turned out for you! My 9 year old just made these for the family and they were a big hit. They smelled so good while they were cooking too! Yummy. We’ll definitely save this recipe and use it again. Thank youErin! Could you make these ahead of time and freeze them? Definitely Stephanie! We do that all the time. I like to microwave them to warm them through a little bit, then put them in the toaster to crisp up. They are delicious this way! Just be sure you cool them completely, then freeze them flat in a single layer so that they don’t turn into a waffle blob. Once they are frozen, you can put them in a ziptop bag. Very yummy! I substituted coconut oil (virgin – melted) for the butter. (Be aware that if the milk and eggs are too cold ,still, it will solidify the coconut oil. I just scraped it down in the blender and blended all the ingredients a second time.) They turned out delish! My kids kept commenting on how good it smelled in the house while I was making them. Will definitely add this recipe to my repertoire. Thanks! YAY Alisa! Thanks for the scoop and the coconut oil and for letting me know how these came out! Has anyone tried subbing almond milk for the skim milk? Just curious if it turns out the same! Caitlin, I don’t know of anyone who has tried this specific substitution, but I don’t see why it wouldn’t work. I hope you love the recipe! I’m making them this weekend, so I will keep everyone posted!! I used coconut milk and it was so tasty! These were the perfect Saturday morning healthy breakfast! I made a few substitutions and they worked very well: I subbed coconut oil for butter, coconut milk for milk, and a gluten-free flour blend for the ww flour. I needed to add an extra 1/2 c of liquid because of the gf flour… but these were a hit! Thanks for a keeper recipe. I am so excited to hear this Katie! Thanks so much for trying the recipe and letting me know how it came out for you! Can you make them in a standard waffle iron vs Belgian? Definitely Amy! I hope you love the recipe. I made these for me and my girls this morning using one cup whole wheat flour and one cup quick oats. They all like them, and I’m glad you have so many recipes that are DASH diet approved and still taste good. I’m happy to hear the waffles were enjoyed by everyone, Kelly! Thank you so much for taking the time to report back. This recipe has become a family staple! Thank you! I’m so happy to hear that, Martha! Thanks so much for taking the time to leave this awesome review. I am so happy to hear that Annette! Thanks for trying the recipe and taking time to leave this kind review! Whooo hooo!! I am so happy to read this Kathy. Thank you for trying the recipe and taking time to leave this glowing review! This is my go-to waffle recipe for the weekends!! Loved it. YAY Claudia! I am so pleased to hear this, thank you! Ooooo nice they look perfect! And I love how you added the apple sauce! Hi Marcia, I’m not familiar with oven waffle pans, but if you’ve successfully used other waffle recipes in it, I don’t see a reason why you shouldn’t give this one a try! I hope you enjoy it if you do decide to experiment.